This little Ocean Jewel is my hide away and soothes my soul. Direct Ocean front. I never tire of the continuous flow of the waves and the changing tides. The gulls, pelicans, sanderlings , beach combers, dolphins and anglers enjoy my space while keeping me amused. Fishing boats, sailing boats, pleasure boats, and casino boats cross the horizon. When you need to come inside, the comfy leather sofa and chair will cuddle you for a book, nap, or some TV time. a DVR will record ny program you wish to view later. The cable channels are many, including movie channels. There is also a DVD if you have a movie you want to watch. The Kitchen has most any appliance you will need including stove, oven, microwave, dishwasher and full sized refrigerator. Bathroom is a tiled walk=in shower, commode, and sink/vanity. The Bedroom has king bed with TV/DVD, a small desk, closets. This building is concrete and steel and has withstood major hurricanes with little to No damage. Being Dog friendly we have selected the best quality bed linens to assure easy cleaning between guest. 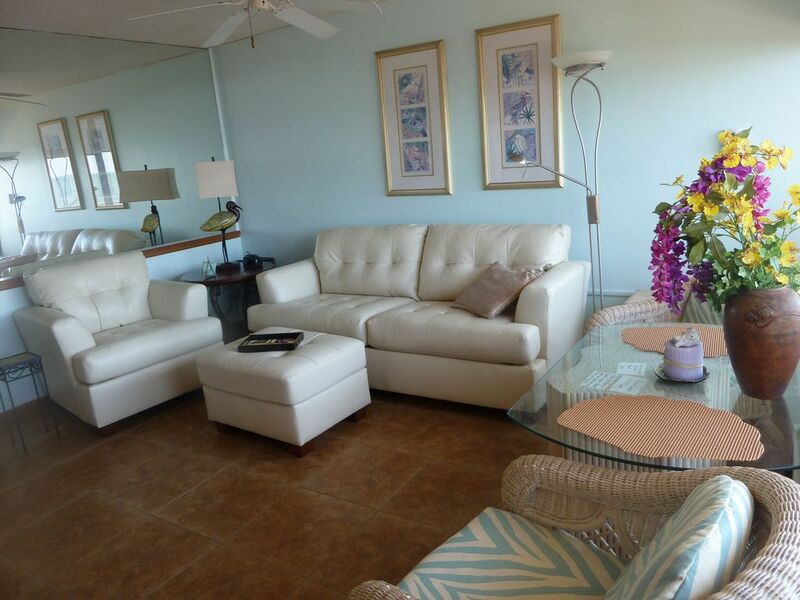 Our tile floors, leather furniture assure we can bleach and disinfect between guest. We have never had any problems being dog friendly and providing clean and comfy environment. Our non-dog guest have been just as comfortable. We enjoy sitting on the beach, walking to the Cherry Grove Point at low tide, fishing from the surf or on the pier, playing frisbee, or reading a good book. You can take advantage of the areas many attractions which are nearby. Our new highways make it easy to avoid heavy traffic if you wish to detour around Myrtle Beach or drop into the center of activity. This is a quaint, well maintained building circa 1980. Each season we upgrade interior furnishings and fixtures to maintain your comfort and your pets. With this in mind, please understand we are not a spacious nor a newer resort type property. Our active HOA insures we handle upgrades to the exterior property as weather and timing permits. Our building is concrete and steel offering quiet and safe surroundings. Our interior is tiled through out making it easier to maintain people and pet friendly environment. And of course, the Atlantic Ocean is in the front yard. Note that calendar may not be up to date until all units in this little building are full, so please ask. We have 3 Pet Friendly one bedrooms and one 2 BR also listed with VRBO/HA. Because of fear of loosing our dog privileges, We do not accept 2 larger dogs in the summer months. Off season they are considered. One bedroom unit available next door if traveling with friends and family. Also a 2 BR available in same building. Since this is a small building, other owners and I keep in contact so we can serve your needs with first floor, second floor or third floor needs in an ocean front condo. Happily serving guest since 2003 with VRBO/HA. IF YOU HAVE A DOG FOR consideration, please give me that information at time of inquiry. i need age, breed, size. WE CAN NOT RENT TO PIT BULLS or ROTTWEILER. WE DO NOT RENT TO DOGS LESS THAN 1 YEAR OLD. WE DO NOT RENT TO CATS. Hi, I am Jacqui. My husband and I own this little Jewel on the ocean and offer to share it here. We live in North Myrtle Beach and enjoy the ocean all year. But we also like to check on our Moose In Cape Breton Island, Nova Scotia. So if we are not here when you are, maybe we are moosing in the mountains on the Gulf of St. Lawrence. Whether I am in the south or the north I will most likely be knitting, weaving, felting, hiking or fishing. I will certainly have one of my dogs with me, JJ or Zander. We bought this Jewel to have a place to play on the ocean and share with family and friends.. Our home is within 2 miles so we can easily have a day trip or spend a few nights.. The unobstructed balcony view of the Atlantic and beach is awesome. We love watching the dolphins and birds, the fishermen by boat or on shore, and the incredible walkers strolling the beach.. It is never lonely because the ocean breeze is your friend. Surf fishing is fun when the fish bite, and the Cherry Grove Point at low time is incredible to walk around. Beautiful condo with a beautiful view! We enjoyed a quiet weekend away. The other guests were friendly in passing and the area was a perfect stay! Thank you!! Excellent location. Literally a few seconds and you're walking on the beach. Perfect size for 2 adults and our 4-legged friend. All the amenities that one would need and our location on the 3rd floor offered a panoramic view up and down the beach. Eat-in or Eat-out; you decide. Good supermarket nearby & lots of restaurants to choose from. I am so glad you had a good visit. Sorry I missed meeting you. I hope doggy had fun too. Please keep us in mind for future beach get-away. Thank you so much for letting us host you and your doggy. Please think of us for your next visit. Enjoyed our two-night stay. This condo is very reasonably priced and good for two people--but no more. Well-equipped but a little short on wine glasses and coffee mugs--the sort of thing that is challenging to keep up with, given many guests coming through. Otherwise, couldn't have been more pleased. Thank you David and Sigrid. I am glad you enjoyed your stay and appreciate your comments. Thank you so much for telling me about wine glasses and coffee mugs. I will replace them right away. Superb location with spectacular views. Super clean, nicely decorated with all the comforts for a relaxing time. Appreciate that this is pet friendly too! Highly recommend. Thank you Brian. I am so glad you can appreciate our wide beach, ocean front jewel. Being able to bring your doggy along is super fun. I sure appreciate your kind words and recommendations. Prices are estimates and may be lower than quoted here due to an unforeseen vacancy or may be a bit higher on holidays or special events. Please inquire. Prices include linens and one dog.